We have traveled around the world, inspired by what humans have created in celebration of God. In our travels we have collected sculptures that were representative of various faith traditions. These pieces were the original inspiration for our interfaith catalog. We delighted in the variety of these many cultures, but mostly we were touched by the common threads of Divine Guidance and Compassion evident in so–called primitive art as well as masterpieces. Combining our various artistic and technical skills, we developed Mission Studios’ growing collection of fine sculptures. 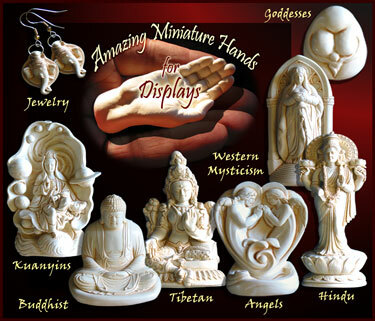 We start each sculpture at a larger size and then miniaturize them with an invention we received in prayer. The final pieces are then individually cast by hand, antiqued and polished, by our family of artisans in Oregon. Our ivory substitute is warm to the touch and very durable, it is also environmentally friendly. Our sculptures, like fine ivory, should be protected from direct heat and sunlight. They can be cleaned with mild soap and water. Try adding a drop of aromatic oil on the porous backs! We wish that our museum quality sculptures will serve as daily reminders of Divine Love in a world that may sometimes seem overwhelming. We are grateful for this opportunity!